Protect your belongings from pickpockets and slash-and-grab thieves with the Anti-theft Travel Bag from Travelon. Featuring hidden, slash-proof, Chain Link construction and an adjustable, cable-reinforced, cut-proof shoulder strap. The roomy main compartment features a locking zipper and pockets for organization. The rear organizer includes slots for credit cards, and pockets for travel documents. The zippered expansion pocket holds a camera, water bottle, or sunglasses. For more than 35 years, Travelon has been making travel easier and safer with products that provide protection, peace-of-mind, safety, security and organization. 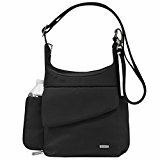 Travelon’s Anti-Theft Cross body and travel bags protect from pickpockets and thieves and are customer top rated. Classic silhouettes in soft fabrics provide great function and fashion. This Anti-Theft Messenger Bag protects your belongings from pickpockets and thieves. Travelon has been making “Travel Easier” for nearly 30 years with fashionable, functional products that are designed and built to last.